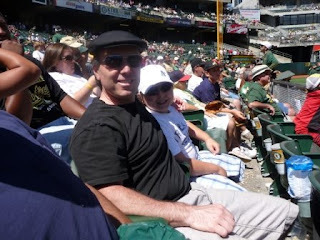 Alec and his Uncle Sean had an awesome “Boy’s Day” at the A’s game! They took BART in to Oakland, enjoyed some hotdogs at the park, and watched the A’s win by a landslide! 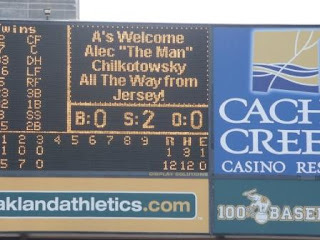 With a little help from our friends, Sean was able to surprise Alec with his name in lights! Thanks Sus and Matt! Maybe next year Max will join them!